...where one man's explorations of the oft over-looked and neglected selvedges of creativity are mended into existence. one of the advantages of working nightshift is that everyone else is asleep and you have more free time to mess around with stuff. or to wander the world wide web and become entranced by things you may never have been exposed to before. i've seen cigar box guitars around before and always dismissed them as a poor imitation of a mountain dulcimer (an instrument i've loved and played for years). i now realize that i was sadly mistaken! this little baby went together much faster than i expected and i still have a few modifications that i want to make, like finding a nice vintage bakelite knob for the volume, some abalone fret marker dots to inlay on the ebony fingerboard (instead of the little red stickers), and i have a set of skull-shaped tuners on order that will replace those garden variety ones in it right now. i even found a cool metal plate for the hookup jack that i am thinking of installing. but for now, he's got a sweet acoustic sound and a killer electric beef that i get to play with until those other parts arrive! i've never played a four string guitar before, so i'm still learning the fretboard layout and discovering the chords (which are surprisingly different than on a regular six string guitar). at the moment, i'm just using a basic glass slide by fender for the slide work, but i have found instructions for making a genuine (that's pronounced, "jen-you-WINE") bottle slide from an old wine bottle that i plan on giving a try. i recorded this little noodle session through a line 6 pocket pod which is an ingenious little speakerless amp with hundreds of tube and filter combos built right in which gives me a direct line to record from on my laptop, could be plugged into a headset for practice, or be plugged into an amp and used effectively as a pre-amp. hope you enjoy hearing a little something on my latest obsession! meanwhile, back to some needle chanting on community at large in between noodling around on my new geeTAR! 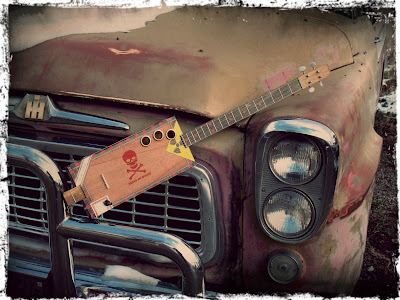 i know, cigar box guitars are simply amazing in their scope and tone from such a humble little reclaimed bit of wood! Hey Joe...sounds great! I can't believe how fast it came together! 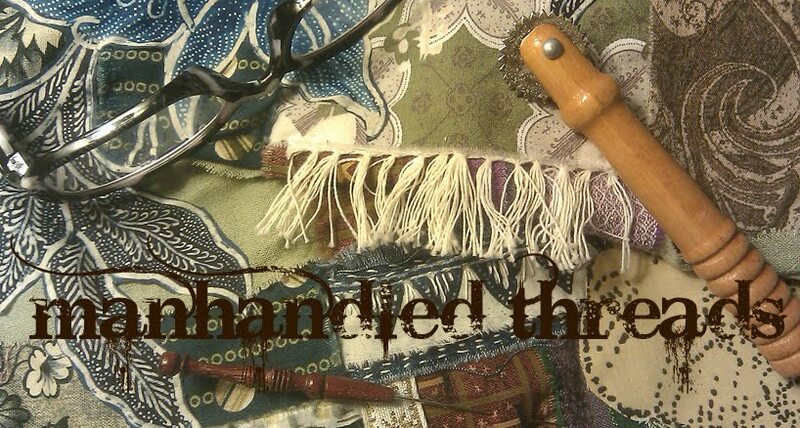 i know...once i got going, it all just sort of fell together effortlessly! i absolutely love that link! i'd seen random pics from that site here and there... what fun would it be to have an all out steampunk guitar!! You can follow him on FB too, if you like :) Easy way to keep up with what's new! Joe, I keep coming back to this post (in my head or for reals!!) Loved hearing your voice and guitar playin'...and now my guy showed me these guitars, and I had to share with you! it's always fun with art can be functional, too! a practice amp is basically just a speaker, like a p.a. system. this one is somewhat more geek-intensive than that...but the results were the same in this case. ha! enjoyed that so much, wow Joe, nice to hear your voice as well! Wow!!! Amazing...sounds fantastic. Your talents knows no bounds. Love that sound. It would be fun if you and my husband could get together for a musical interlude...he plays the dulcimer. how much fun would that be?!? i play dulcimer, too (mountain, not hammered). have for a couple decades now. he'd probably have a ball rummaging through my rather extensive dulcimer collection! it's GREAT!!! !, i LOVE it and loved hearing your voice!!!!! this is One Good Day!!!!! woohoo! 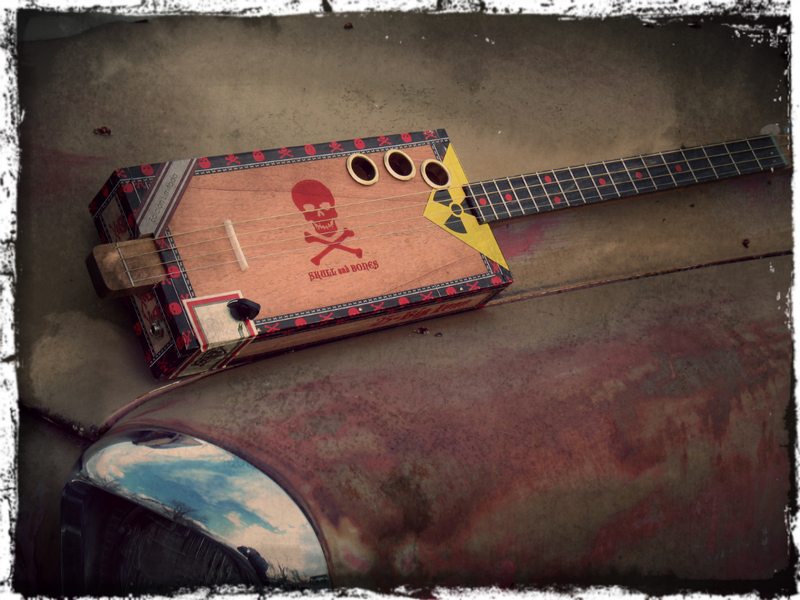 toss a stomp box under my foot and a tin can mic in your hand and all we need to do is start booking the festivals!! Hello, Good sound, good vibes! We enjoyed it also. how nice to create music with modest things turned instrument from your own hands! Hey Joe, Manford and I listened to your playing and we loved it. Thanks for sharing. Like Grace I've got to agree: great day starting with music like yours! ha! oh how i'd love to be jangling some blues on my little cigar box guitar in duesseldorf in the morning!! so pleased you enjoyed it! Wow! That really has a sweet sound and looks great! Thanks for the song. isn't it amazing what a humble cigar box can produce? sent you a private email requesting system info so i can try and figure out why you are having difficulty! DON'T BELIEVE IT ....! A cigar box ???? isn't it amazing? such resonant sound from an unexpected place! i was just messing about. not *really* playing. still getting the hang of only haveing 2/3's of the strings that i am used to on a guitar. thanks so much for your kind words! Wish I could here it...aargh! My iPad has some strange restriction...anyway it's a beautiful guitar! sorry, suzanna! i have one other person accessing on an ipad and i'm not sure why the apple mobile browser is having trouble with it. it's a simple embedded audio player. i'm looking into it, but while i'm somewhat of a software nerd, my experience with apple products is limited. So, I put down my iPad and sat down at my computer and Voila! A cigar box gee-tar! Wow! It sounds great! Really! Such a full sound! oh good! i'm so pleased you found a way to access the sound byte! Well, I am a bit late to the party but WOWeee, so glad I got here! Sooo great to listen to your fingers making that soulful ceegar-box sing, and sooo great to hear your voice too. Thanks for sharing your music. well, when does your first itunes recording come out?! That was really a sweet soulful sound. I think the events of those who smoked those cigars may have come thru that box. thank you for sharing. I'd like that first recording too. Holy toledo! Amazing tone and twang! Robert Johnson is tapping his toes in heaven!